In this School of Everything Special you will find out all you need to know about publishing your very own book. You will get a clear idea about what a self-published book is, ways it can be produced, and how it can be sold and distributed. 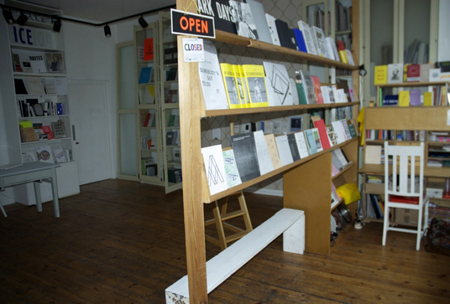 You’ll be given the chance to browse the ‘X Marks the Bökship’ shop to see the type of self published books that it stocks. Eleanor will then talk you through the key points of self-publishing in chronological order from conception to distribution answering questions about printing, quantities, ISBN numbers, distribution, costing, and selling it. You’ll certainly benefit from this class if you’re an artist, photographer, writer, illustrator or designer who has a body of work you’d like to use to make a book and publish independently. But you’re also welcome if you’re none of these things and just interested in learning about self-publishing. Eleanor Brown runs a publishing project space for independent publishers in a bookshop called ‘X Marks the Bökship’. It promotes independent publishers through book launches, talk programs and the distribution of small press titles. Eleanor is also the editor and publisher of The Newpaper, a newspaper about artists and writers working with Newspapers. She regularly works with UK artist Fiona Banner producing publications for The Vanity Press.